Lardersaga – is the musings of a rather food obsessed family. Our life is dictated by what is going to be on the table. Actually it has been for the last 12 years of my life, from the plains of Africa, to a catering unit in Battersea and now to the family kitchen in London and the country. Friends and family have nudged me to start sharing some of my kitchen secrets and this is a humble attempt to begin. I hope it will be a journal, and a journey, about what we are eating now, what is growing (or not) in our garden, and what I have learnt in my search for endless culinary wisdom. It is also an outlet for my pent up cooking frustration – which I hope you will excuse me for! My name is Joanna, I used to be called Noodles but now only by a treasured few. ‘Mummeeeee’ is what is I hear most of the time from the ‘blue’ and the ‘pink’, as we tumble through every day life. Food is very important to me and I think I must be extremely greedy as it occupies my thoughts most of the time. What to eat for lunch, what to cook this weekend, what new delight I can try on the ‘little people’. I think I probably cook in an indulgent way but I am careful never to waste anything. My culinary journey started in New Zealand about 18 years ago working for the wonderful Kathy Paterson. I must have been a horrific gap year student in the kitchen but I got fast at peeling garlic and hand crushing it with salt. A subsequent 4 week course at Leiths School of Food and Wine launched me somewhat naively into the homes of unassuming clients as the cook for countless numbers, in remote holiday houses on the periphery of England and Scotland. Edinburgh University featured for 4 years, but sadly the degree did not stand the test of time and a mere 2 years after graduating I was back in the kitchen, albeit on a different continent. Deep in the African bush, in the lush Luangwa valley, (nestled in the East of Zambia) I spent 2 absurdly happy years, cooking for Robin Pope Safaris. The necessary stint cooking in the Alps featured somewhere and then it was back to real life and Sugar&Spice was born. Fast forward the clock 10 years, I am now fully unemployable, very happily married and trying to attempt raising the ‘little people’. We juggle our life between London and the country, shipping countless cool boxes up and down the M4 each weekend. I miss the adrenalin and pressure of cooking but love the challenges presented by the ‘pink’ and the ‘blue’. There really is never a dull moment. I still cook alot. I cook for Mr.P, the ‘little people’, friends, family and maybe in time the odd client again! 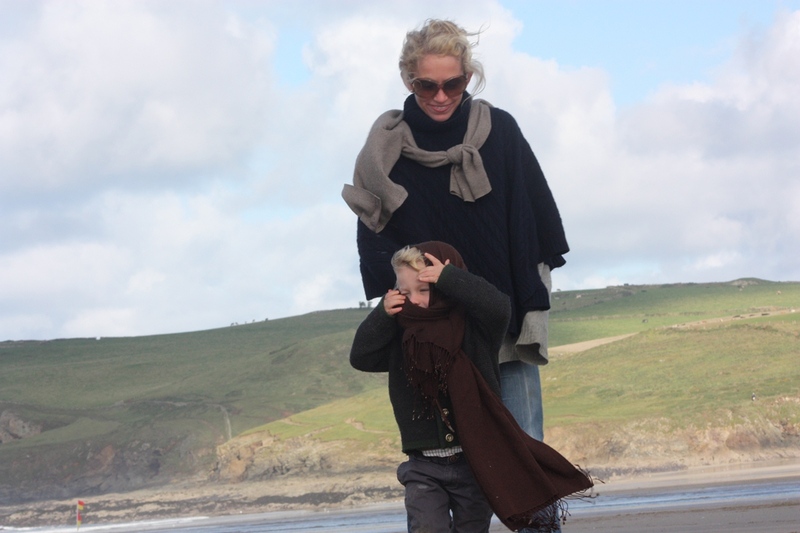 I love this blog and love taking the photos for it. One day I will ingratiate myself in the world of food again, maybe as a cook, maybe as a food stylist, maybe as a photographer. Who knows where this will take me, but the journey so far has been seriously fun. I hope you enjoy reading my culinary tales and that they may at some stage prove useful and the recipes inspiring. Happy reading, happy cooking and importantly happy eating. 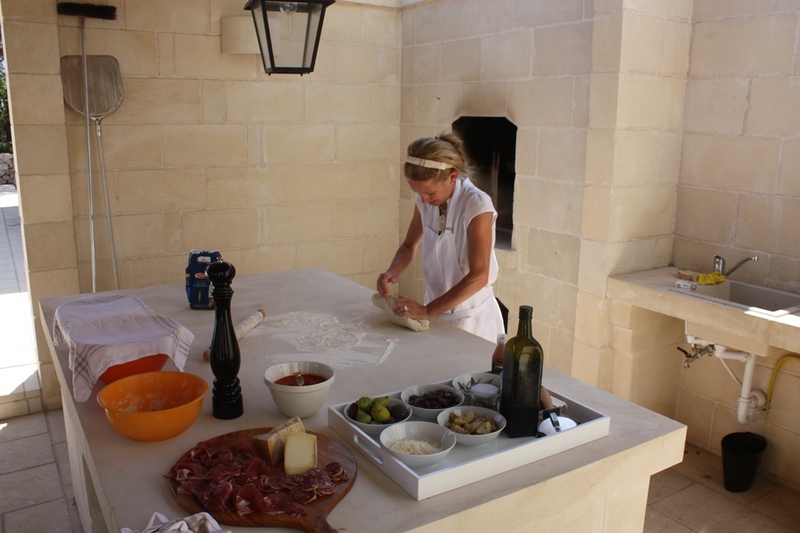 The author, Joanna, ‘Noodles’ to some, ‘Mummeeeee’ to the ‘little people’, kneading pizza dough in Puglia 2012.